My relationship with cleanser has been brief. After branching out testing a different brand I had a severe breakout all over my chin which took a while to hide and recover. Because of this bad breakout I’m always a little hesitant when trying a new skin care routine. My basic routine was always Simple face wipes and then Simple moisturiser (I can hear beauty gurus moaning as I type). This routine is mainly down to me being far too lazy. When I get in from work the first thing I always do, unless I’m going out, is remove my makeup and general London pollution as quickly as possible. That all changed when my best mates told me to try Liz Earle Cleanse and Polish. I’ve heard them bang on about it for years but never got over my fear of trying something new on my sensitive skin. To ease myself in gently, I bought the starter kit consisting of a 100ml bottle and two muslin cloths – although I now think this was pure luck as it should have only came with one! I tried it as soon as I got home and I loved it. The first step is to massage one or two pumps onto dry skin, massaging into the face and neck. I tend to do my eyes last, as this is where I wear the bulk of my makeup. After you’ve done this, rinse the muslin cloth in hand-hot water and wring out before gently wiping off the cream. I then splash my face with cool water. This product has so many of my favourite ingredients; beeswax (helps to relieve chapped skin), eucalyptus (eases muscular pain), cocoa butter (super moisturising) and rosemary oil, which smells divine. I love the creamy consistency and the ease at which it removes my makeup. I don’t know why it’s taken me this long to try it for myself. In the evenings I like to apply Neal’s Yard Beauty Sleep Concentrate to my face and neck, massaging upwards in small circles. There’s something about using these two products together that my skin loves because its never felt so soft and looked so glowing. 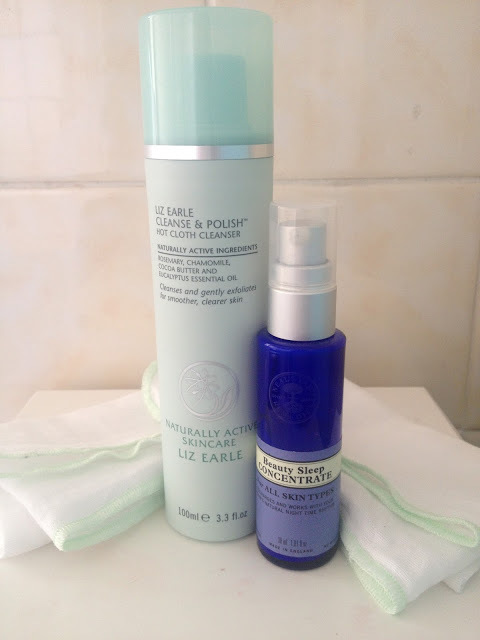 Liz Earle, I bow at your perfectly pedicured feet.